Sit back and let the robot vacuum your home? Within recent weeks I had the pleasure of seeing the Samsung SR8825 NaviBot in action and it got me thinking about the pros and cons of such an advanced machine. Sure, the idea of a vacuum moving around your living room without requiring your input seems ideal, but there are also other problems associated with these little robots that at first glance you wouldn’t notice. 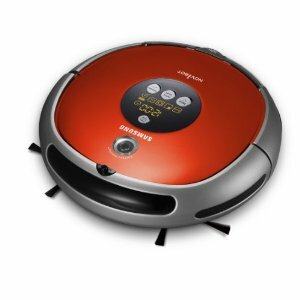 My demonstration involved the SR8825, a recently launched robot vacuum cleaner, which looks like one of my old portable CD player, except on a much larger scale. The start up and actual vacuum cleaning was fairly loud, but no louder than most vacuums. It’s the one area most manufacturers have never really been able to overcome. Not a problem with this machine, though, as you can schedule this one (and other similar models) to vacuum when you’re out or in another room. That seems ideal to me as I find our vacuum cleaners scare our baby and our pets. The demonstration was in a square room with a door. It was fascinating to watch how methodically the machine catches every inch of the room, carefully following the walls without bumping into them much. It move much slower than I use my upright vacuum cleaner, but who really cares? What I didn’t see was how easily the machine could get around corners and how it approaches a drop, like a flight of stairs for example. I hear these machines have come a long way since the original idea of a robot machine many years ago. There are sensors in more current models that stop the robots from falling over edges. These robots can follow the edges of walls and furniture pretty well, although they will never be as good as using, say, a crevice tool of a manual vacuum cleaner along the edges. Think, however, about access in between, under or the back of furniture. If the space isn’t big enough for the robot to slip through, it won’t be vacuum cleaned. As I look around my own living room, I can see straight away all the areas these robots wouldn’t be able to cover. And there are plenty of them. In fact, there is only a small amount of space the little robots would be able to get to, so I would have to rearrange my furniture. Cleaning underneath furniture can be problematic if access is too low. Often this is solved by using various tools provided with manual cleaners. These robots could do with go-go gadget extendible arms for these areas. When I immediately think about obstacles, I think about furniture, but this isn’t always the case. Think about cat/dog beds, children’s toys, shoes, bins, radiator pipes, stair gates etc It means a lot of tidying up or moving objects around so that the robot can have access. This seems obvious, but it’s worth pointing out that only one floor at a time can be vacuum cleaned at any one time.